features how to cook barbecue as well as tracing the history of BBQ and includes information about famous que restaurants and pit masters from NC. You can read more about Holy Smoke at my outdoor cooking web site - Yes You Can Grill. I don't really excited about most books on barbecue. They usually just have recipes and try to improve on or add odd ingredients to classics. No. I really don't especially want to put mango on my chicken. I like that in my fruit salad. Thanks. Holy Smoke really isn't a cookbook, although you do get a lot of inside secrets to making North Carolina barbecue and also directions for some sauces, slaws and even desserts like the famous Pig Pickin' Cake. It's more like walking back in time (and up through today) and getting to meet and talk to everyone who played a part in making barbecue big in the Tar Heel state. You don't have to be from North Carolina to appreciate Holy Smoke. It's a fascinating story for anyone who enjoys barbecue in general or who likes great stories of people and places. Holy Smoke would be a great book to give to anyone on your gift list who enjoys outdoor cooking or for family and friends from the South. It's also a fun read for general history buffs. YUM! I found you via Viewpoints! I'm going to add you to my blogroll here on blogspot. Hi Jenny! Thanks for stopping by. What name do you go by at Viewpoints? Holy Smoke looks like something I'd like to check out. Thanks! It tasted as good as it looked too. 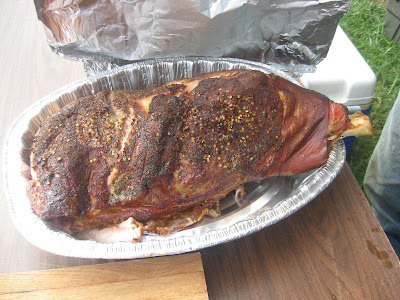 One of the farmers out in the country smoked that shoulder. Yes. Holy Smoke really is a terrific book. One of my all time favs now. I'm sure you'd like it!